Do you seek the best way to transport your items while riding a bike? In this article, you will learn about everything from bike backpacks to panniers. The benefits of riding a bike can be huge. You may find yourself less stressed, more physically fit, and with more energy than ever before. It is for this reason that many people choose cycling as one of their main forms of transportation. However, with benefits, usually comes a few weaknesses. The biggest one for biking is that it is quite difficult to carry objects around if you aren’t properly set up. 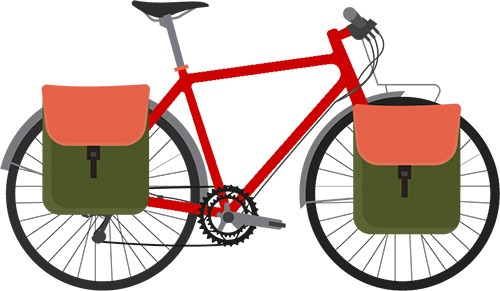 Throughout this article, we are going to talk about different carrying and hauling options for cyclists so that you can continue to ride your bike in comfort while transporting goods. Have to carry your laptop for school, no problem. Want a way to bring your groceries home from the supermarket, we have you covered. What about just bringing along some tools and a water bottle? We will cover that too. No matter what you want to bring with you (while still being realistic (no it isn’t possible to carry a Hippo on your bike)), you will learn what works best for each individual situation. Choose a backpack that is designed for cycling. Let’s start off with one of the most common ways of transporting objects when you are on a bike. For many people, a backpack is their go-to option for carrying just about anything on a bike ride. You can carry your books to school, your office supplies to work, tools and water for the ride itself, some groceries; the list goes on and on. However, it important to know the limitations and benefits of a backpack. Before getting into that though, I must take a minute to say that not all backpacks are created equal. There are regular everyday backpacks, and then there are bike backpacks. DO NOT get an everyday backpack if you want to use it specifically for cycling. The reason is simple, bike backpacks are designed to be ergonomic when in a riding position (usually leaned over a bit), where normal backpacks do not offer this benefit and can get quite uncomfortable. Cycling backpacks are also offered better security to your body than a normal backpack, meaning your load won’t swing and bump around. The biggest positive to wearing a bike backpack is the fact that at the end of your ride, you can just stand up and continue to carry your items to wherever they need to go. Any other carrying option is going to require some sort of process to un-attach or remove the transported goods and then carry them elsewhere via other means (your hands for example). Another great thing is that backpacks come in many different sizes, so you can get one that suits your needs exactly. Some backpacks also offer safety features. 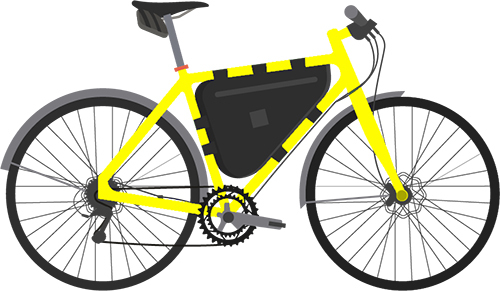 Mountain bike specific backpacks may go as far as offering back protection, where most will just have reflective detailing and places to clip lights as their safety features. 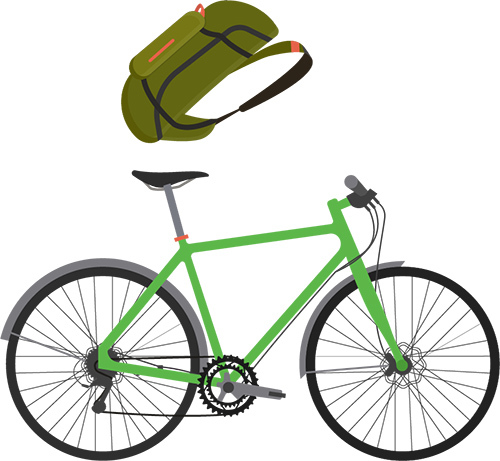 Cycling backpacks are also great because you do not need extra attached to your bike when riding. Some people hate when the bike itself feels weighed down by extra goods, but this is a personal preference. There is one thing that comes to mind in particular when thinking of wearing a bike backpack, and that is having a sweaty back. Nobody likes the feeling of a soaking wet back when out on a ride, or on your way to work or school. Even though bike backpacks are well designed to allow for as much airflow as possible, it will still happen to an extent. Another thing cyclists don’t like about bike backpacks is that in some cases they will move around a lot when riding. This isn’t usually a problem with high-end packs but it is still worth keeping in mind. The final issue with bike backpacks is that they can make a sore back even worse. If you already suffer from a bad back, all of that extra weight on it probably won’t help to try another method for transport. Let me give you guys a quick breakdown of what bike panniers are before I go into any more depth of bikepacking. Bike panniers (or as some people call them “side bags”) are basically bags that are attached to you bike. They are mounted onto a rack (see further in the article to learn more about racks), or directly onto your bike frame. The bags will sit on either side of your back wheels, front wheels, or both and are placed so that they do not interfere with pedaling. Typically panniers are used for long distance rides, bikepacking, or for transporting goods around town. TIP! For balance reasons, always make sure your panniers are loaded with approximately even weight on each side. This will keep you bike from wanting to tip over on one side. Also, remember to buy panniers that suit your needs. Do not buy under-warranted big ones “just in case” as they will unnecessarily weigh your bike down. Bike panniers are a great investment for people who don’t like wearing backpacks because they allow you to securely transport items, without having to fix them to your body. This allows for total freedom of movement on the bike, and often a more comfortable ride. Panniers are also nice because they can be a set and forget method of transporting goods. By this I mean, once they are installed, you can leave them there all the time so that they are there for you when you need them. Some panniers even feature a quick detach option that allows you to remove it from the bike easily, and carry the items inside it. You can even find backpack panniers which are essentially the best of both worlds. One final positive mention for panniers is their ability to take a huge amount of weight without causing too much trouble. Since it is not attached to your body, the extra weight can be evenly spread out in each pannier, keeping your ride stable. Some say that a downside of panniers is that your feet hit the bags when peddling. This should not happen and probably means that they chose the wrong bags for their bike, or that they installed the bags incorrectly. The biggest downside that actually exists is that panniers greatly change the feel of the bike. For cyclists with heavy loads, yes you will have to pedal a fraction harder but that is not what I am getting at. You will only really notice this if you plan on using them mountain biking (which I do not recommend). You will see that nimbleness of your bike will disappear as it is loaded with bikepacking weight. 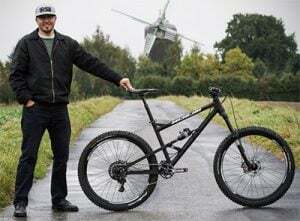 This performance drop is why most mountain bikers stick with other methods to transport and carry their items. Bike baskets are especially nice on vintage or cruiser bikes as they emphasize the styling and can make your bike look even better. Baskets are a simple and traditional way to transport items while on your bike. Baskets can be found mounted on a front or rear bike rack or attached to the handlebars and frame. It is most common for people to only use a front basket but some opt for a front and rear basket for maximum carrying potential. Some baskets are removable so that you can carry them around when you are shopping. One thing to watch out for is if the basket has a cover or some sort of restraining device. In some cases, your items may come out of the basket when riding if they are not properly secured. Bungees always work great as well for when the basket doesn’t feature any sort of restraint. Bike baskets are especially nice on vintage or cruiser bikes as they emphasize the styling and can make your bike look even better. There are even different colors to choose from so from a styling standpoint, baskets can look great! The other main positive of a basket is that they are a quick access option. There is usually no unzipping required to access what’s inside. Even when riding it is then possible to grab something such as a water bottle from your front basket with ease. On the other side of things, bike baskets can be a bit annoying when bikepacking. 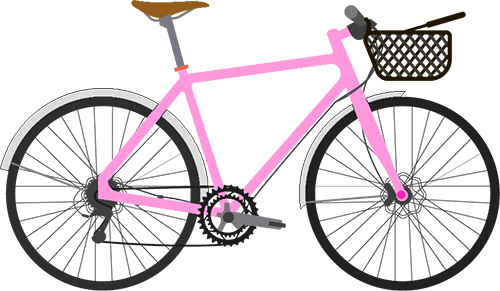 If you put too much weight in a front basket it can throw your steering off which is why heavy loads should be placed in a rear basket or panniers. As mentioned above baskets often don’t feature restraints, so make sure your load won’t fall out if it is just left loosely in there. Finally, baskets tend to wear a bit quicker than other options in this article so they are better for people who only need them on occasion rather than every day. The biggest benefit of having racks on your bike is the ability to attach things to them – goods, bike panniers, rear basket and so on. For the purpose of this bikepacking article, when I say bike rack I mean the kind that you attach to your bike for carrying things (not ones to put your bike on). Bike racks can be attached to either the front or back of the bike and are almost always held on via brackets attaching to the bike frame. The biggest benefit of having racks on your bike is the ability to attach things to them. Bike racks are a necessity for most panniers and rear baskets. The other great use of bike racks is to transport items without using other methods. You must strap the object down using bungees so it doesn’t come off when riding. The biggest downside to bike racks is that their carrying potential is quite small without using attachments. Some items such as a jacket can be strapped down with ease but smaller items will fall through the holes. 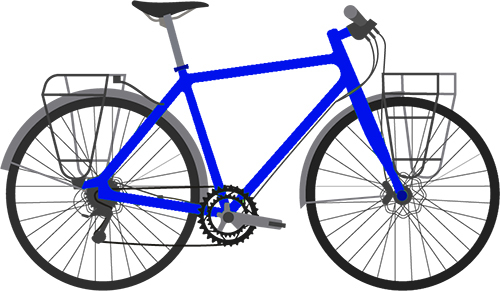 Bike racks can also be a pain to fit on some bikes so make sure bike is compatible with the racks you buy. Saddlebag is ideal for carrying a repair kit & frame bag for just everything. Both are aerodynamical. Frame and seat bags are exactly what the name suggests. They are bags that are designed to be strapped to your frame or under your seat to help ease the transport of goods. Seat bags are often stuffed with small repair kits that include a tube and a few select tools. The benefit to using a frame or seat bag is that they usually don’t need any special hardware to attach to. They typically just attach to the frame or seat using straps (often Velcro). Frame and seat bags are also great as they come in many different sizes but still tend to be more aerodynamic than panniers. They can fit a wide variety of items and can be found in hard or soft shell versions. The biggest downside to frame and seat bags is that they do not always fit nicely on bikes. If you have a curvy frame it may be hard to find a frame bag that fits and looks good. Frame and seat bags often have limited width so bulky items are not as easy to carry as they would be in a big rear basket for example. Where to shop for the bikepacking bags? There are a ton of ways to transport goods while riding a bike. The hardest part is, of course, deciding what method will work best for you. We hope that this article clears up some confusion as to what carrying method works best for certain things. Overall, it is important to realize that every option has its weakness. Sometimes you may even combine different bags to suit your situation. 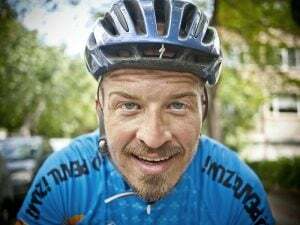 For example, you may always have a seat bag containing a repair kit left on your bike, and then you bring a backpack for everything else when the need is there.